Grieving the loss of someone you love is not only painful but it’s also different and varied. I have lost a number of people in my life over the years and tonight, seeing a simple scene brought such a simple, yet harsh awareness to me. I drove towards the house where my boys live for now and it struck me… it’s loss…it’s grief. Seeing the emotion and the expression of their feelings hit a spot in me that hurts because Willie has no tomorrows. Its something that is getting easier for me than it has been and I rarely actually think about it anymore but this came out of left field so to speak. It wasn’t a conscious “he won’t ever have that” but more of an internal gut feeling of loss that it took me a bit to figure out. Losing a child brings with it a grief that is different from other losses through death. When we lose a parent or an older person in our lives who has had a life longer than ours we mourn for what was. We hold to the memories and those memories and what we have lost – and won’t have again – are what we grieve. That’s what we feel the loss of. Certainly we are sad that we won’t have them with us anymore but it’s different. When we lose a child, depending on the age, there is limited looking back to mourn. In my case, we had 16 years with Willie. At once, a lifetime and a blink. So many years and so few. I mourn and grieve for what we’ve lost…what we had and what we won’t have again. Yet there is also the grieving of what he will never experience. That’s the grief that doesn’t seem to lessen in some ways. An eighty year old passes away and you know that over time, your feelings of pain will lessen as acceptance settles in. That happens with the death of a 16 year old as well. I never thought it would, but it does. It’s been 2 and a half years almost and the pain, while still constant, isn’t what it was… it does get easier to bear and live with. What still stings just the same is the grief for what he’ll never have… the loss of his life that will never be, not just the loss of the life he did have. There will always be reminders of what he won’t be or do or have. So while some aspect will get easier with time, that one grief never will…and that’s hurting tonight. Yesterday, I completed a mud based obstacle race; Mudd, Sweat and Tears. 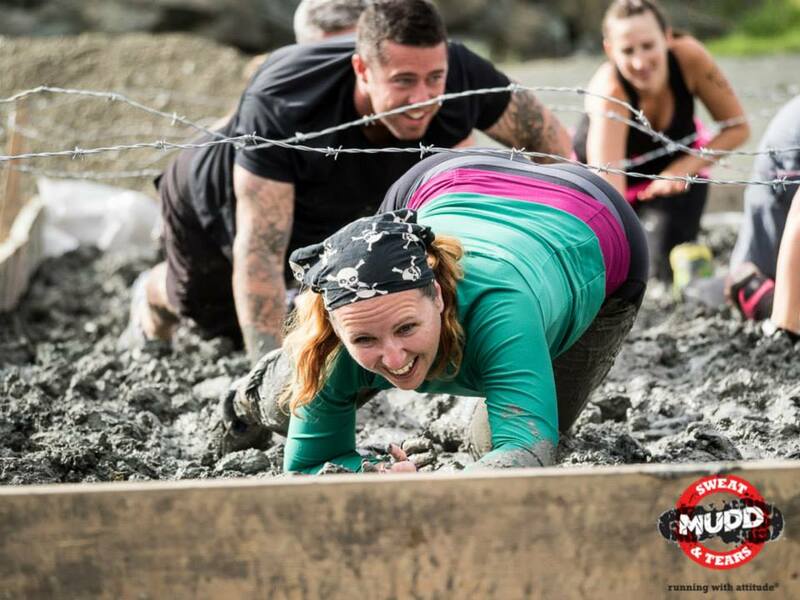 A course comprised of a mud, strength and endurance obstacles, a gruelling mountain ascent and a test of physical and mental will. It was something that I signed up for 2 and a half months ago when I had a 10km road race fast approaching as well that I had set as a goal for myself. My idea was that, as I was coming off of my anti-depressants, it would be good to have some goals and something to train for. The underlying impetus is one that goes deeper for me though and means much more to me than completing a race or two. When Willie died, he left behind notes. Notes that tried to explain in some way what he was feeling and why he was choosing to end his life. Notes that said goodbye and conveyed his hopes for the rest of us left behind. These were personal and private and I consider us lucky to be able to have them to hold on to and to look back to. While I keep his words to me close and personal, one of the sentiments of his note to me was that he wanted, more than anything, for me to continue on the journey of self awareness and growth that I had really undertaken after my last divorce. We had, as a family spent time talking about life choices and decisions and how we affect and direct our own lives…how important it is to live true to each of our own values and beliefs and needs. To be who we are and to love and live how we want… without compromise to our own truth in self. This was something that him and I talked about, a lot, as we spent those last few months. My tattoo of “Truth Freedom Joy” was something we discussed and picked apart… he knew the significance of my wanting to be who I am and to living abundantly and openly. His final note to me embraced that wish that I go on and be true to myself and finish what I had started with that direction. I have, many times in the last 2 and a half years, felt like I am letting him down and like I am not honouring his memory … depression and grief have clouded my ability for a long time to live my life and to have that joy and feel again. Laughter and joy and sheer fun have been fleeting and sparse. The vast expanse between the ups and downs has narrowed these last few months though and I am starting to see that the journey I was on when he died is still ongoing… that my truth is still there… with an edge that hurts, yes, but still there. The race was gruelling and more challenging than I thought I could handle at times – but not once did I think I wouldn’t finish – exactly how I have always been in life… confident and sure of my abilities… a feeling that has been hard to grasp since he died. Many times that it was a matter of one foot in front of the other and just going on…but there were times that the race was also fun and full of unexpected laughter… smiles and high fives and feelings of sheer joy at accomplishments and just the experience of doing things that I never thought I would, or could, do. The race yesterday was completed with his bracelet attached to the strap of my tank top, tucked in next to my heart (lots of mud and crawling – not risking losing it on my wrist! )…Willie, and his wish for me to go on… very much with me every step of the way.. as he will be for the rest of my life. One foot in front of the other, sometimes impossible feeling to go on and other times full of laughter and joy. Life. Almost 2 and a half years ago today and I still wonder. There had been so many other dates that you set for yourself to end it; so many other times that you berated yourself afterwards for not completing what you set out to do. Did you know that this time would be different? That this time you would go all the way through with it? Saying goodbye to your little brother the night before, did you know that would be the last time you would hug him and call him your “little buddy”? Our conversation in the car, did you know that would be the last we would have? That night when you went to bed, was it with the knowledge and assuredness that it would be the last time that you would fall asleep? Showering the morning of your death, folding your laundry and putting notes where they would later be found… did you know that this time, there would be no “after” an attempt. Choosing your clothes to wear that day; did you know that they would be the last ones you would ever wear? Did you flip the calendar page to February that morning, the morning of the first, knowing that it would be the day that you really did it… the day that we would always know as the day you died? Did you know that the next day, the sun would come up and another day would begin; and that you wouldn’t be there anymore? Did you know all this… and did you welcome that knowledge?